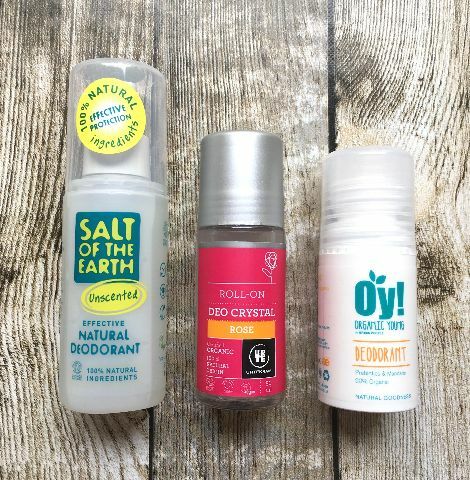 Choosing a natural deodorant is hard, they work very differentlly to antiperspirants that you can buy in most high streets, obviously, and they come in hundreds of shapes and sizes these days, so we've tried to do some of the work up front for you. Long story short, there are two different active ingredients in deos that we believe are effective - not all suit everyone and clearly, someone with a super active lifestlye has different needs to someone working in a pretty sedentary job, you get the picture. Some people might find that they need to reapply a deo before or after going to the gym, which they didn't have to with an antiperspirant, that's pretty normal and to my mind, a small price to pay to avoid some of the ingredients in antiperspirants. The two types of active ingredients we've found effective are potassium allum and a prebiotic based formula - yes, there are others and pretty much every Wellness blog will have things to say about bicarbonate of soda (which I personally find to be an irritant over time) and arrowroot powder (which again, I struggled with, it felt claggy for want of a better word). With different needs, personal tastes, and ethics all in mind, we've settled on the following three deos that work for us. The Salt Of The Earth Spray - it's one of the potassium allum formulas and does what it says on the tin, it's a spray on deo. It's not scented, they last a long time, vegan friendly, all the things you'd expect. They're 100ml and the ingredients are as follows: Aqua, Potassium Alum, Propanediol, Triethyl Citrate, Aloe Barbadensis Leaf Juice*, Galactoarabinan, Sodium Bicarbonate, Sclerotium Gum, Sodium Anisate. *Organic. 132g. Urtekram Rose Roll on Deodorant - this is another one of the potassium allum ones and it's lightly rose scented, pleasant to use, and in a glass bottle with a plastic roller. They're 50mls and the ingredients are as follows: Ingredients: Water, glycerine**, crystal, polysaccharide, rose geranium* and lemongrass oil*. Nothing else. * = Organic farming. ** = Made using organic ingredients. Shake before use. Naturally occurring crystals dissolve by heating bottle in water. 10% organic of total, 87% organic of total minus water and minerals. 148g. The Oy Roll On Deodorant - this is the allulm salt and prebiotoc option - it's the one with the very pleasant and mild citrussy scent and again, it's effective, doesn't seem to leave any marks and it's nice to use, not sticky - it's 75ml and the ingredients are as follows: Aqua (spring water), potassium allum (natural mineral), olea europa , helianthus annuus (sunflower) seed oil, zinc ricinoleate (from castor oil), cetearyl gluscoside (plant derived) cetearyl alcohol, butyrospermum parkii, glyceryl stearate, levulinic acid (plant dereived) alpha-glucan oligosaccharide (prebiotic) aloe barbadensis juice powder, rosmarinus officinalis leaf extract, aroma (citrus aurantium oil, citrus nobilis oil, citrus limon oil, cinnamomum bark oil, lavandula angustifolia, vanilla planifolia oil, cetearly olivate, sorbitan olivate, sclerotium gum, xanthan gum, sodium streaoly glutamate, sodium lauryl glucose carboxylate, lauryla glucoside, potassium sorbate, sodium benzoate, linallool, limonene, citral, geraniol. *89.4% organic. 102g.